When I lived in downtown Salt Lake, I never missed the Annual Greek Fest. I mean, how could I, you could practically smell the Slovakia from my apartment. I love the fresh clean flavors of Greek cuisine. Ripe tomatoes, cucumbers, a full and fruity olive oil, feta cheese...my mouth is watering. I'll never forget the taste of my first Gyro from a street vendor in Athens when I was 14, and I'm hoping that one day my husband will acquire a taste for Calamata olives. 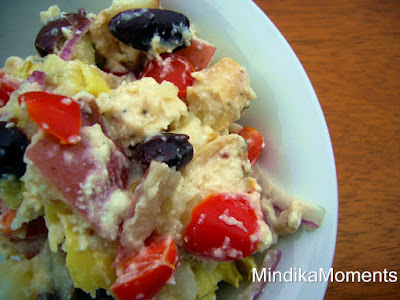 That's why I love this Greek version of potato salad. It's a summer favorite and a whole heck of lot healthier than your classic American potato salad. Try taking this to your family and neighborhood barbeque's this summer. It's sure to be a hit. When I want to make this salad a meal, I add a little shredded chicken or grilled chicken. 1. Boil potatoes in salted water until tender, 12-15 minutes; drain. 2. Mix all the ingredients for the vinaigrette in a blender. 3. Combine tomatoes, cucumber, olives, onions and oregano. 4. Add potatoes, chicken and vinaigrette. 5. Lightly mix until vinaigrette is evenly distributed. 6. Chill the refrigerator before serving. I love the Greek Festival too! How luck to have a Gyro in Athens! I'll have to try this salad!